The Swedish brand's specialty is putting a spin on otherwise bland, every day garments and the label's increasing popularity grows every day, thanks in part to social media. There are always going to be twists and quirks in a Jonny Johansson-designed collection and this season, he brought his A-game to the runway: covetable sweater dresses, fun Pucci-esque swirvy patterns, statement accessories. It was a great turnout. Ok Phoebe, you win, always. Every season, she turns up with something completely different and refreshing without ever losing that very distinctive identity that makes her clothes, well, her. Femininity is always very loosely interpreted in a Céline collection, but it's always there nonetheless. 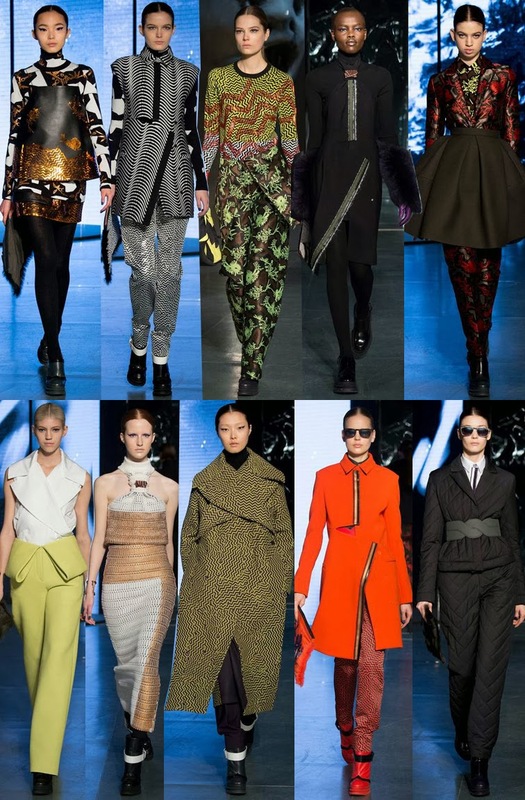 For fall 2014, the masculine references are more present than ever: boxy shapes, incredibly sharp tailoring, tweedy menswear fabrics, trousers. There was also a very straightforward message of comfort throughout: blanket coats, two-piece knit ensembles, nothing was too tight or clingy on the body. When I think of the Chloé aesthetic, I inevitably conjure up images of easy elegance. The very essence of the brand is based on what the young ingenue would wear. Clare's appropriated that point of view from the get-go and continues to sharpen it season after season. The palette for outerwear came in soft hues that is sure to inspire stylish cocooning tendencies, whereas the clothes, true to the Chloé girl, embraced both romantic femininity with flowy, airy dresses, and tomboy personality with loose shorts and button-downs, trousers and sweaters. The man who brought gothic sensibilities to the high fashion roster has veered toward feminine elegance for fall 2014. It all felt very luxe and regal but never lost its edge, thanks to sharp suits and armor-like bodices on otherwise frilly gowns. Humberto and Carol continue to breathe new life into Kenzo. The duo behind many fashion crazes and for championing the quirky, out-of-the-box sensibility is composed of two genius storytellers, we know that much. It was made even more clear when they asked David Lynch to add his special flavor of fantasy to their fall show, which seems like an instinctive match. Their clothes are for the whimsical and while a lot of the pieces might be considered too over-the-top for some, they never fail to make everyone smile. 100% agree with everything you said about Celine... always on point. always amazing. Love reading your recaps since not only do i love reading your pov on the collections but also i dont always get the time to visit the shows best. My fave in your mentioned redux: Acne's sweater dresses: reminiscent of some celine FW14 pieces on another level, to some extent. but Chloe is my fave! Feminine without screaming "girlie girl". LOVE!